My day begins at 6:45 a.m. when I get ready for the day and head downstairs for breakfast. I order my daily pancake and mango shake. At 7:30 a.m., we are picked up by three Tuk Tuk drivers, one of whom is also a teacher at Treak Community Center. He is a part-time Tuk Tuk driver while he is not working at the school. 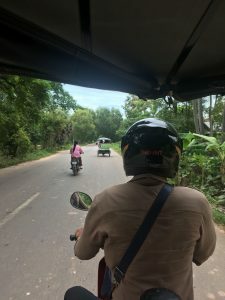 He mentions to us before the ride that he has recently married and that he needs the extra money because teachers are underpaid in Cambodia. We dash between other motorcycles on a chaotic road, and make it to the school by 8 a.m. The first three hours of the day we build bricks made of recycled plastic, sand, and concrete. We begin the process by cutting up used up plastic into tiny pieces. After, half of the group mixes the sand, concrete, and plastic together while the other half oils and sets up the molds to begin creating the bricks. We fill up the molds with the mixture and then wait for them to dry before we pull them out from the mold. Today we build about 200 bricks for a bathroom in the village. By the time we finish it is 11 a.m. and it is time for our two hour break. The school closes down for two hours to give teachers time to eat, rest, or prepare for their daily lesson. I use this time to eat a snack and call back home. At 1 p.m. school is in session again, and for the next three hours I am in the a classroom for 3 and 4 year olds with two of my classmates. In this classroom we support the teacher by practicing English with the students through games and songs. We also introduce the students to new arts and crafts. Today we make birds using construction paper and feathers with the students and we use their artwork to decorate the classroom. The children get a 30 minute playtime break; we go outside and start blowing bubbles with them. After the 30 minutes we come back inside and sing a few songs and suddenly it is time to go home. At 4 p.m. it is time to return back to the guest house. We freshen up and get ready to go out to dinner. We walk around for a few minutes until we decide where we will be eating for the night. Some days it is typical Khmer food, but I am beginning to miss the food back home so we stumble upon a Mexican place for dinner today. After dinner we head over to the night market where we eat fried ice cream or search for the perfect souvenirs for our family. We finally decide to head back to the guesthouse, and I unwind for the night by watching a show on Netflix, or recapping the day with my roommate.